Like I mentioned earlier this week Neil Young is streaming his new album online before it will officially be released on April 7. So I was able to give it an early listen. From the start of the album it sounds very much like Neil Young. Guitars are screaming, amps are coughing and the riffs sound grungy. Neil's voice isn't what it used to be but who can blame him. The album has its share of nice heavy grooves ("When World Collides" and "Fuel Line") but Neil takes his foot off the pedal to take it slow as well. This results in a slow country style ballad "Light a Candle" and the very beautiful "Get Behind The Wheel". The album title song "Fork In The Road" reminds me of Hendrix's "Gloria". "Cough Up The Bucks" sounds a bit odd and is pretty up to date with the financial crisis singing "Where Did All The Money Go?". It's all good honest rock 'n roll but it's nothing new. And why should he? 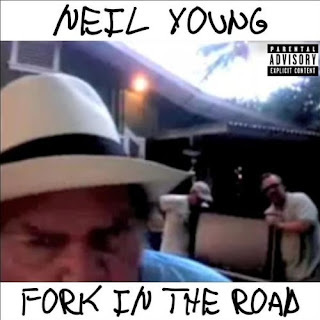 He's Neil Young and he can do whatever he wants. And that's playing rock songs. Catch him live if you get the chance.